Today is National Comic Book Day and I thought I'd share some of my favorite series with you. I need to catch up with this series, but I have loved the first few issues. 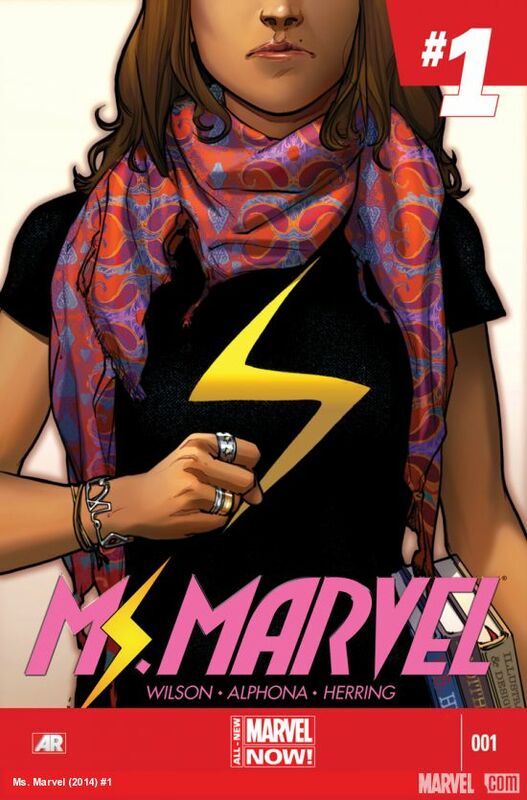 Kamala Khan is just trying to be a normal teenager living in Jersey City. Things get weird when this fog shows up and covers the city. Kamala wakes up with some super powers. She's on a delicate balance to begin with between her traditional Muslim parents and her desire to just be a normal American teen. Now add in these superpowers she's not quite sure how to control and things get interesting. There are nine issues out already with more on the way. You're a fun-loving, high-maintenance girl that grew up in a New Jersey suburb. You live close enough to New York City to want the clothes and the cosmopolitan lifestyle, but you're not brave enough to move away from you over protective parents. What's a girl to do? If you're Zoe, you marry the first God of War that crash lands in town during a life or death struggle with his evil adversary! But, what happens when even an all-powerful God can't exactly measure up to your elevated expectations? There was no question I was reading this series! I enjoyed the series but I will say the end was a bit of a disappointment. The next series is another one I enjoyed and felt disappointment at the end. Well I was disappointed that it ended. DC's Lil Gotham. The stories started out based around the holidays then moved into more family-esque stories. I liked that the stories weren't just about the good guys. There were a handful that focused on the lives of our favorite villains. One of the things I really enjoyed about this series besides the stories was the art work. It was really great. The last one I want to share is a short one with only 4 issues. It's called The Answer! and it's put out by Dark Horse. Devon is a librarian who is a wiz at puzzles. She's also an insomniac. It's late one night when her life gets really interesting. It involves a puzzle, The Brain Trust (a weird secret group) and a man in an exclamation point mask (a weird kind of crime fighter).